Where: NACo's 2019 Legislative Conference in Washington, D.C.
NACo's International Economic Development Task Force will hold a discussion of the recent tariffs implemented in 2018, trade relations with China and other shifts in U.S. trade policy. Panelists will discuss how county leaders can prepare for the effects of these trade issues on their county economies, as well as how county leaders can continue to encourage international economic development within their counties. NACo research has produced county export profiles that describe the volume and distribution of export activity. You will need to log in to view these profiles. On this Task Force call in November 2018, representatives from the U.S. Trade Representative and the U.S. Department of State gave members an overview of the USMCA, how it differs from NAFTA and what county leaders should expect from the changes. They also discussed how county leaders can prepare for this change and other upcoming changes in trade policy. Click here for notes from the call. Counties across the nation encourage international economic development in many ways, but not every county leader understands all the tools available to their communities and businesses. The Center for Regional Economic Competitiveness (CREC), in collaboration with Stone & Associates and SRI International, is producing a rigorous set of tools that counties across the U.S. can use to develop and execute a plan to attract foreign investment and promote exporting, called the International Engagement Ready Communities (IERC) initiative. At the IED Task Force meeting in July 2018, Mr. Mark Troppe and Mr. Michael Stone presented the results from their analysis from the IERC initiative and held a hands-on, interactive session to train county leaders how to use the IERC toolkit to better engage the global market. Click here for more information. At our IED Task Force meeting in March 2018, Task Force members met with representatives from various federal agencies to discuss the tools available for counties to drive international economic development in their communities. Continuing along this theme, Mr. Bill Houck from the Small Business Administration (SBA) discussed in May how county leaders can take advantage of the State Trade and Export Promotion (STEP) grant program and help small businesses in their communities succeed in the international marketplace. Following Mr. Houck’s presentation, Mr. Andy Karellas, Executive Director of State International Development Organizations (SIDO) discussed how counties can better partner with states to encourage international economic development. From employment in U.S. subsidiaries of foreign businesses to jobs in U.S. companies exporting abroad, international trade brings many jobs to county economies. Counties play an essential role in creating a business-friendly environment for these activities. Hosted by the IED Task Force, this session - entitled, "Federal Tools for County-Driven International Economic Development" - brought together representatives from various federal agencies to talk with county officials about tools that the federal government can offer those wishing to expand international trade and business in their county. 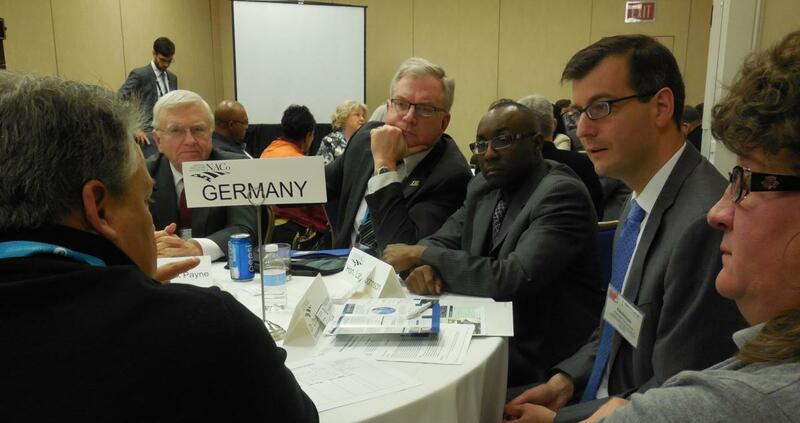 The meeting was structured in 15-minute sessions that allowed county officials to network directly and in small groups with the representatives, foster connections and learn how they can partner with the federal government to encourage economic growth through international investment and exports. Click here for more photos from the meeting! On November 14, 2017, the NACo International Economic Development Task Force held their Fall Conference Call to discuss SelectUSA and how its services can help counties expand their economies internationally. Ms. Anne McKinney gave an overview of SelectUSA and the services they can offer counties to foster job-creating business investment. Following her presentation, Mr. Bill Cronin, Mr. Brent Barkway and Mr. Ajay Sujanani discussed their work in three Florida counties - Pasco County, Pinellas County and Hillsborough County - to create a regional hub for international business. Bill Cronin: President/CEO, Pasco Economic Development Council, Pasco County, Fla.
Brent Barkway: Business Development Manager, Pinellas County Economic Development, Pinellas County, Fla.
Ajay Sujanani: Vice President of International Business, Tampa Hillsborough Economic Development Corporation, Hillsborough County, Fla.
On July 23, 2017, the NACo International Economic Development Task Force took a tour of Prime Equipment Group, a middle market company that produces poultry processing machines, including many used by Kentucky Fried Chicken (KFC). Prime Equipment has 130 employees located around the globe with offices in Columbus (Ohio), Gainesville (Georgia), Mexico and Brazil, as well as distributors in Italy, Russia, Thailand, Australia, Argentina and Chile. At Prime, Mr. Gasbarro discussed the focus and history of Prime, how Prime began its international sales, some governmental programs that have been helpful in their growth and what counties can do to help foster a good environment for companies like Prime. During the drive to and from Prime, Mr. Schimmer spoke about Franklin County’s Economic Development and Planning initiatives. On June 15, 2017, the NACo International Economic Development Task Force held a conference call on the North American Free Trade Agreement (NAFTA). Mr. Ferguson provided an overview of NAFTA and discussed the renegotiation of NAFTA. Specifically, the current administration is reviewing our trade deficits with Canada and Mexico in an effort to bring more manufacturing opportunity to the U.S. Commissioner Starkey and Mr. Mudano presented on the American Manufacturing Skills Initiative in Pasco County, Fla. as a best practice example. The IED Task Force held a special speed-networking event at the 2017 NACo Legislative Conference. The Task Force brought together representatives of four industry groups from three different regions and countries – Africa, Canada and Chile – to talk with county officials about the investment interests of foreign businesses in the United States, what export opportunities exist and what counties can do to foster the international side of their economy. Before the round table event began, Ashley Bell, Special Assistant to the Secretary, spoke to Task Force members on behalf of the U.S. Department of State. The IED Task Force held a conference call to discuss the Trans-Pacific Partnership (TPP). Mitchell Ferguson, Deputy Director of Bilateral Trade for the U.S. State Department’s Bureau of Economic and Business Affairs, gave a presentation explaining the details of the TPP, the debate around the TPP and how it could affect both American businesses and county leaders. Karen Richardson, the Deputy Assistant Secretary of the Bureau of Public Affairs at the U.S. State Department, also joined us on the call. The IED Task Force hosted a mobile workshop at the 2016 NACo Annual Conference along with the Transportation Steering Committee. 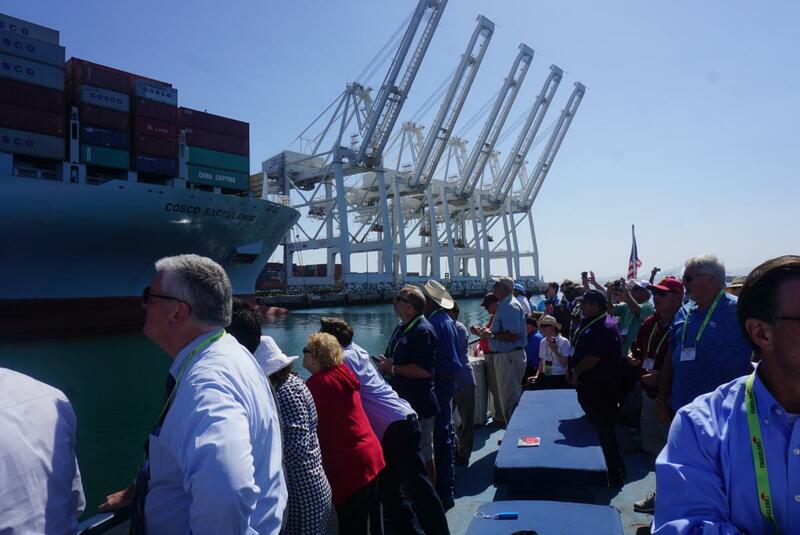 Participants took a 90-minute boat tour of the Port of Long Beach, given by Don Snyder, the Port’s Director of Business Development, to learn firsthand how the second largest port in the U.S. moves millions of container units each year. 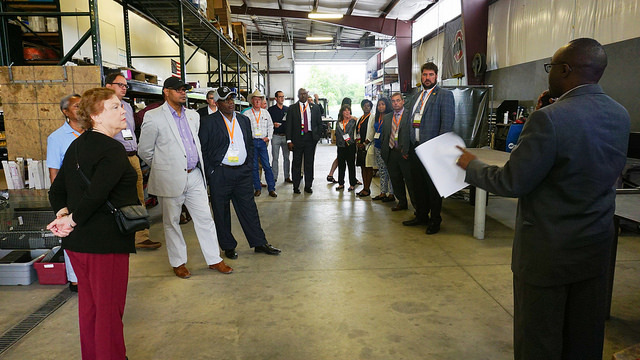 Through the tour, Task Force members and other participants received a glimpse of the complex logistics and supply chain dynamics that ripple across the country. Joining us on the tour was Karen Richardson, the Deputy Assistant Secretary of the Bureau of Public Affairs at the U.S. State Department. The IED Task Force held a conference call on the role counties play in fostering international trade and business, especially in helping businesses expand internationally through exports. The Task Force listened to a presentation by Ashley Zuelke, the Associate Director and Senior Advisor for Export Policy, Promotion and Strategy at the International Trade Administration. Following her presentation, Mayor Mary Lou Berger of Palm Beach County, Fla. and Kelly Smallridge, CEO of Palm Beach County’s Business Development Board, presented a best practice highlight of what their county is doing to encourage international trade. The IED Task Force held a special speed-networking event at the 2016 NACo Legislative Conference. The Task Force brought together representatives of six industry groups from three different countries – Brazil, Germany and India – to talk with county officials about the investment interests of foreign businesses in the United States, what export opportunities exist and what counties can do to foster the international side of their economy. County News Article: "Trading Places: Counties Search for the Best Deal"
The IED Task Force met at the 2015 NACo Annual Conference and heard two presentations. The first presentation, given by Mr. Mark Vitner, a Senior Economist at Wells Fargo, was on the effect of the rising strength of the U.S. dollar on U.S. exports and exports. The second presentation, given by Bo Carson, the Vice President of Information Services at the Research Triangle Regional Partnership, was on the NC Research Triangle and collaboration in the global economy. The IED Task Force held a joint meeting with the Community, Economic and Workforce Development Committee’s Economic Development Subcommittee at the 2015 NACo Legislative Conference. They heard a presentation on NACo’s County Economic Tracker 2014, a panel discussion on the impact on the impact of the U.S. Export-Import Bank and updates from the U.S. Department of Commerce’s International Trade Administration (ITA). The IED Task Force met at the 2014 NACo Annual Conference and heard presentations about the U.S. Export-Import Bank and the role of counties in international economic development. The Task Force also heard updates on the Made in Rural America initiative and the ongoing regional forums. The IED Task Force met at the 2014 NACo Legislative Conference and heard presentations about the economic recovery of counties and economic development as a practice area. The new business of the Task Force was partnering NACo to the "Made in Rural America" export and investment initiative. The International Economic Development Council (IEDC), the leading trade association serving economic development professionals provided a one-hour training session on protocols in dealing with Indian partners and strategies to attract and retain foreign direct investment (FDI) from India. 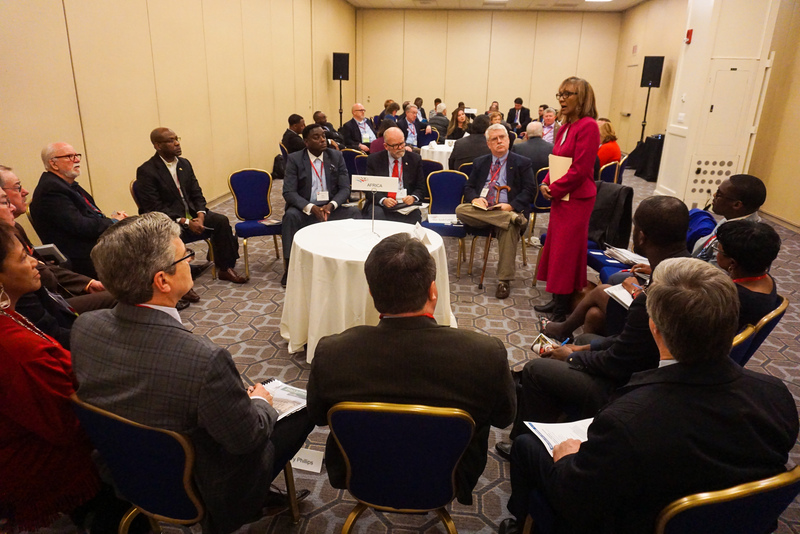 During the 2014 Legislative Conference, NACo Leadership met with several groups to engage resources for local partners in promoting exports and attract investments in our communities. The task force leadership had meetings with the German Embassy, the Representative of German Industry and Trade, SelectUSA, the U.S. Ex-Im Bank, the U.S. Trade Representative, and the federal partners in the "Made in Rural America" export and investment initiative--U.S. Department of Agriculture, U.S. Department of Commerce and the White House Rural Council.